Adding or rubbing salt to wounds have been phrases traditionally used to describe situations where conditions have worsened due to one reason or the other. Sprinkling of salt increases the intensity of the wounded person's pain manifold. That the same salt has immense healing powers, especially when it comes to treatment of allergy-induced asthma patients, is big news for ordinary people. Like other districts of Sindh, Tando Muhammad Khan is also home to a number of historical graveyards namely necropolis of Pir Aman boasting the tombstones of Talpurs of Tando Ghulam Ali, necropolis of Shahwani Talpurs at Tando Muhammad Khan, necropolis of Jahan Khan Bhurgri in the village of the same name, a cemetery containing tombs of Ismaili saints Araddin and Joharddin at Fateh Bagh, etc. 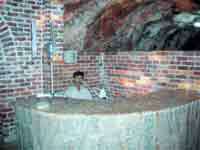 On a recent visit to Khewra salt mines, the scribe found an allergological asthma resort fully functional there. Built for treatment of asthma patients at a cost of Rs.10 million with financial assistance of the corporate sector, the resort is being managed by Pakistan Mineral Development Corporation (PMDC). Currently, the centre has 20 beds and treated 125 patients since its inauguration on March 23, 2007. Shehnaz Sheikh, former Olympian and legendary hockey player, was the first allergy patient treated here. Therapy used is quite simple and natural. Patients of asthma, dust and pollen allergy are kept inside a specially designed tunnel for a certain period of time. "Here they inhale natural salt particles which open narrow veins of respiratory system and after spending around 110 hours recover from asthma disease," says Dr Mirza Muhammad Ashraf, Chief Medical Officer (CMO), PMDC. He tells TNS that at maximum the patients can stay for around 8 hours a day inside the mine. The remaining hours of the day have to be spent at a hospital built outside the mine. Therefore, he says, the hours required t o be spent here are spread over a couple of weeks. Ghulam Abid, an official guide at the resort, says the centre is being run on no-profit no loss basis. The total cost of allergy treatment is somewhere around Rs 5,500 per patient. This includes expenses incurred on boarding, lodging, clinical treatment, medical consultation, laboratory tests etc but excludes those made on food, he adds. 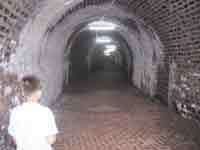 Treatment for asthma in underground salt mines is called speleotherapy. "There are asthma clinics already working in Ukraine and Poland salt mines. We studied their system and tried to replicate it here in Pakistan. Fortunately, we have succeeded," says Maqbool Mazari, Resident Representative PMDC, Lahore region. A patient Muhammad Ameen, a dust allergy patient hailing from Manga Mandi, Lahore, tells TNS that he is feeling better after spending three days inside the centre. "The air here is cold and clear. I hope I am able to breathe as easily as I can now when I go back to my polluted city after two weeks." The scientific phenomena that gives healing power to air blowing inside salt mines is that it contains negatively charged chlorine atom. This atom removes positively charged particles from the air such as smoke, pollen, dust mites, odour, mould, bacteria, electro-smog and many other pollutants. The air temperature inside Khewra salt mines remains 18 Celsius throughout the year and gives visitors/patients a feeling of warmth in winter and cooling in summer. This makes the inside atmosphere pleasant and expedites the healing process, says Hasnat Kamboh, PMDC spokesman. 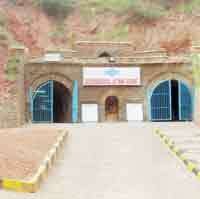 Hasnat says the setting up of this treatment centre has added to the tourist value of Khewra salt mines. He says around 40,000 tourists come here every year to visit these salt mines -- the second largest in the world and next only to those found in Poland. Situated in the foothills of the Salt Range, the Khewra Salt Mines were discovered in 326 B.C. when horses of Alexander the Great's army were found licking stones in the area. "On interrogation, it was found that the rocks had significant salt content inside them," Hasnat adds. However, the graveyard of Jats located at some 20 kilometres south of Tando Muhammad Khan near the famous Buddhist stupa is quite prominent. It is also known as Makhdum Jo Qabristan (cemetery of Makhdoom). It can easily be approached from Saidpur village. The necropolis is hovering atop the hill overlooking the railway line that connects Tando Muhammad Khan with Hyderabad. The cemetery contains gravestones of Jats. The graveyard contains more than 20 tombs, of which some are richly carved, carrying representations of mounted warriors and jewellery. Some tombs carry epigraphs along with decorated slabs that are strewn up hill down dale in the necropolis and some even beyond the limits of the graveyard. On one of the destroyed gravestones, camel is depicted in carving; on another slab one can find a depiction of a skillfully carved mounted warrior. On some of the tombstones are impressions of horsemen preceded by footmen. Amid scattered slabs of the gravestone, there is a slab that bears the inscription that reads the name of Sathi Khan Jat. Apart from these, four other tombs carry the inscriptions of Bahko Jat, Bhai Khan Jat, Taghio Jat, and Sobdar Khan Jats respectively. These tombs have fallen to pieces though; the inscriptional slabs can easily be found lying close to the destroyed tombs. These people died in a battle fought against the Chang tribe. In the chronicles of Sindh, this battle is known as 'Jatan ain Changan Jo Maro' (Battle of Jats and Changs) that took place in 1786 A.D during the rule of Mir Fateh Ali Khan Talpur (1783-1801), founder of Talpur dynasty. The battle started after a Jat woman killed a Chang by hitting him with a cooking pot over a molestation issue. In retaliation, some people of Chang tribe killed a brother of the Jat woman. Jats struck back killing three Changs followed by a series of clashes between two tribes. These frequent clashes between tribes eventually led to a tribal war. All the Jats of Lower Sindh and Kutch came to support the Sardar Sher Khan Jat, then chief of Jats. Jats were a powerful tribe in lower Sindh. Even Mir Fateh Ali Khan Talpur was afraid of the rising power of Jats. In order to rein in their rising power, Mir Fateh Ali Khan openly supported Chang tribe. He even forced some other tribes namely Jamalis and Khosas to fight by the side of Changs. However, almost in every encounter, the Changs and their supporters faced humiliation. Eventually, the Changs with the support of Mir Fateh Ali Khan collected a large conscript to face the Jats in a final battle. Jats also collected their tribesmen from lower Sindh and Kutch and prepared for final combat. Subsequently, rookies of both Changs and Jats met in the battleground on the outskirts of the Jati town and fought valiantly. However, Jats displayed more skills in wielding sword and heroism in the battle. The Jats won the battle, Changs retreated from the battleground turning the swords into ploughshares. The ballads of battle are still sung by bards living in lower Sindh and Tharparkar who sing and amuse people with their rhythmic narrations. They sing the gallantry and heroism of these individuals. They also have scrupulous record of every lineage of the Jats who engaged in the battle. The notable lineage of Jats who took part in the battle were Othar (camel breeder) Thatiar (buffalo raisers) Mithanis, Radho, Hamrani, and Halani etc. Folk tellers also narrate the story of individuals from both tribes who fought bravely in the battle. Those who died were buried in different graveyards of Badin, Thatta and Tando Muhammad Khan. The people of Chang tribe were buried in graveyards of Ram Baraho in Badin, the battleground which is known as Jatan and Chagan Ja Der in Jati (a necropolis that contains communal graves of both the Changas and the Jats). Some Jats were taken for burial to the Makhadum Jo Qabirstan in Tando Muhammad Khan. The tombstones of Jats are famous in the region for the inspiring engravings. Apart from the geometric and floral designs, figurative representations also decorate the structures indicating the aesthetic of the builders who seem to have profoundly banked on local themes for their artistic expression. Sadly, almost all the tombstones have fallen into pieces and their decay and destruction are unnoticed. Strangely, avaricious people have unearthed all the graves believing that treasure is hidden underneath the tombstones. Moreover, locals have begun taking away some of the valuable decorative slabs. In order to stop the destruction of the tombstones, concerned authorities should chalk out a strategy to bring to task those who have played havoc with the heritage. Concerted efforts should also be made to restore these fabulous pieces to their past glory.